From the beginning, Nellie Bly was a woman not to be messed with. When she read an article in The Pittsburgh Dispatch entitled ‘What Girls Are Good For’ – which was, according to the article, making babies and doing the household chores – she was angry enough to write a response to the paper under the pseudonym Lonely Orphan Girl. No one would have guessed that this would be the start of a groundbreaking career that would change women journalists forever. Nellie was born Elizabeth Cochram on 5 May 1864 in Cochran’s Mills, Pennsylvania in America. She was raised by her family on virtues of hard work and determination, and her fondness for wearing the colour pink earned her the nickname Pinky. Wanting a more sophisticated attitude as she got older, she dropped the nickname and changed her last name to Cochrane. At the age of 16, her family moved to Pittsburgh, and upon reading that the editor of The Pittsburgh Dispatch, George Madden, wanted the writer who called herself ‘Little Orphan Girl’, Nellie took her chance and made herself known. 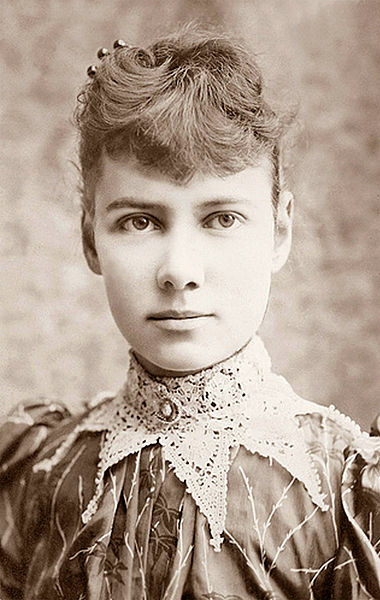 Impressed by her first piece, Madden offered her a full time position at the paper under the pen name Nellie Bly. Her early articles in the newspaper centred on the issues of the plight of the working woman, using factory workers as a case study. But under editorial pressure, she was pushed to the “women’s pages”, which at the time covered fashion, society and gardening. Having none of it, she made the professional decision to go to Mexico and act as a foreign correspondent. It was these articles that later became the basis of the book Six Months in Mexico. However, because of the damning nature of an article that criticised the government, she was threatened with imprisonment and fled the country, later retracting her statement. Moving to The World, a New York based magazine, Nellie was given the assignment that would be the first milestone in her reporting career: She was to fake insanity, get herself committed to Blackwell’s Island Asylum, and report on the conditions there. Assuming the name Nellie Brown, she feigned insanity and stayed 10 nights on assignment. Most disturbing, however, was that Nellie had dropped her act as soon as she got in the asylum, which made the nurses only see her as being more insane. Upon the days spent with the other women patients, Nellie was convinced that some of them were as sane as she was. It was after her release and an investigation by a grand jury that it was decided that one million dollars of extra funds be given to support patients in the asylum. Her writings about her experiences were later published in Ten Days in a Madhouse. Another well-known investigative journalism piece she did all started with a work of fiction. In 1873, Jules Verne published Around the World in Eighty Days. On November 14 1889 Nellie set out to either prove or disprove that someone could travel around the world in eighty days. Her progress was charted in the newspapers and bets were being placed on when she would return. During her 40,071 km journey she met Jules Verne, the inspiration for her trip in Amies. Arriving back in New Jersey on January 25 1899, she was two days later than scheduled. Her completed trip took a total of seventy-two days, six hours, eleven minutes and fourteen seconds. After getting out of journalism and becoming an inventor (and patenting the design for a novel milk can and a stacking garbage can), she resumed her journalism career after employee’s embezzlements led her into bankruptcy. During the First World War she covered Europe’s Eastern Front and most notably covered the Women’s Suffrage Parade in 1913, yet she successfully predicted that they would not get the vote till 1920. After suffering a bout of pneumonia, she passed away in 1922, aged 57, at St. Mark’s hospital in New York, and was buried in a modest grave in The Bronx. This year marks 150 years since Nellie Bly was born and although her journalism career only lasted around ten years, she was the game changer that brought women into the field of investigative journalism, paving the way for women like Helen Thomas. Reporting was seen as a man’s job and women were scoffed at for wanted to acquire a job in such a field. Nellie was the first woman to take a stand and was determined to break the stereotype of journalism being an exclusively male job. Never settling for less, and striving to break stereotypes, Nellie Bly showed women that anything is possible. This entry was posted in Featured and tagged journalism, those certain females, women. Bookmark the permalink.